There are many stages of life - growing from infancy to adolescence entails many life experiences that will prepare us for everything that comes with adulthood. When the time comes for us to begin thinking of raising a family of our own, a new wave of responsibility comes with the milestones of adult life - like buying a home, going on holidays and eventually retiring. Adult life is also about upgrades - whether that be shifting from rentals to a mortgage, or moving from entry-level jobs into more senior positions, change is inevitable in adulthood. An upgrade that you are sure to experience in life is upgrading your family car - your wheels might serve you well for a long time, but no vehicle lasts forever. If you’re not sure about just when you need to make the move to a new family car, let’s take some of the guessing out of the equation. This is the golden question. Good family cars should stand the test of time, but as a rule of thumb, you ideally want to upgrade every 10 years. After this point, most cars will have clocked up some pretty serious mileage and servicing will become even more expensive. It costs more to service an older car because a mechanic will often need to find little bits and pieces of work to keep it on the road. Older vehicles are also less fuel efficient than newer models and will cost more to keep running. It may be an initial expense to purchase a new family car in the short-term, but you may save some serious bucks on the running costs. Cars are complex machines with a variety of mechanical moving parts - all of which are prone to wear, tear and sometimes outright failure. You may want to look at upgrading your wheels if your current ride has a serious problem like a blown head gasket, busted catalytic converter or sprung suspension. These three problems alone can cost into the multiple thousands of dollars to fix. At this stage, you need to decide if you can wear the cost of the repairs and potentially more down the line with your current family car. If you’re planning on having another child (or two or three), then chances are you’ll need to upgrade to a larger automobile. For more than three kids, you essentially have two options - either a 7-seater SUV or a people mover. When the rear seats are strapped up and not in use, 7-seater cars can essentially function as a standard 5-seater car, with the added bonus of giving you additional boot space for extra cargo. People movers are perfect for ferrying around both your kids and their mates to sports practice or other extracurricular events. Before choosing your next car, you’ll need to work out your budget - figure out exactly how much you can afford to spend outright or afford per week in repayments and then compare the market. Researching comparisons between SUVs and minivans will also be extremely helpful when deciding which car is the best for your family. There are a few reasons why you may need to upgrade the family car. The first is if your current car is more than 10 years old. The second is if your current car is up for some serious mechanical repairs that could cost into the thousands. 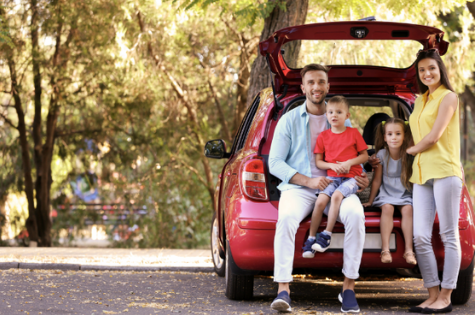 Finally, if you’re planning on another child (or a few more), then you may need to consider upgrading to a larger vehicle to accommodate for your growing family.